· Emerging market of aerospace and aviation within Dayton which is generating a significant amount of jobs and opportunity growth. · There is also a new development plan for a Riverfront design that will help incorporate the atmosphere and lifestyle community into a greater living space. · Dayton is also home of 6 technical colleges and universities. The latest numbers from the U.S. Census Bureau show that the population decrease that has plagued Dayton for years has finally stopped, and the nine-county Dayton region has actually grown in population in the last year. The Dayton metro currently has just over 800,000 residents. Home sales are picking up, too. April 2017 showed the strongest homes sales for the city on record. Downtown Dayton is undergoing revitalization, with new housing and storefronts being added each year that are transforming the urban core from what it was ten and even five years ago. Older parts of town, like the Old North Dayton neighborhood, are also being rehabbed and attracting new residents. These areas, along with the city’s suburbs, are known for being close-knit communities where residents feel welcomed and comfortable. Major industries in the Dayton area include technology, defense and aerospace, and healthcare, all of which are currently experiencing rapid job growth. In fact, the region saw some of the most employment growth it has experienced since the late 1990s. Like other Midwestern cities, Dayton’s cost of living is on the low side. It sits at nearly 12% below the national average, making it an attractive choice for budget-minded people who want the most bang for their buck. You can also find some pretty cool stuff here. There’s a rich aviation history here, as the city is where the famous Wright brothers were born. It’s now home to their National Memorial as well as the National Museum of the U.S. Air Force and the Dayton Aviation Heritage National Historic Park. The city isn’t lacking in culture, either. The Dayton Ballet, Philharmonic Orchestra, Opera, and Contemporary Dance Company all offer up fantastic cultural events throughout the year. Along with top-notch restaurants, bars, microbreweries, shops, and more, there’s always something to do here. For outdoor enthusiasts, Dayton has 330 miles of paved biking and walking trails, along with 19 different parks scattered throughout the metro area. Dayton is a buyer’s market right now. Homes are priced well below the national average, making it an affordable option for investors who get into the market now. 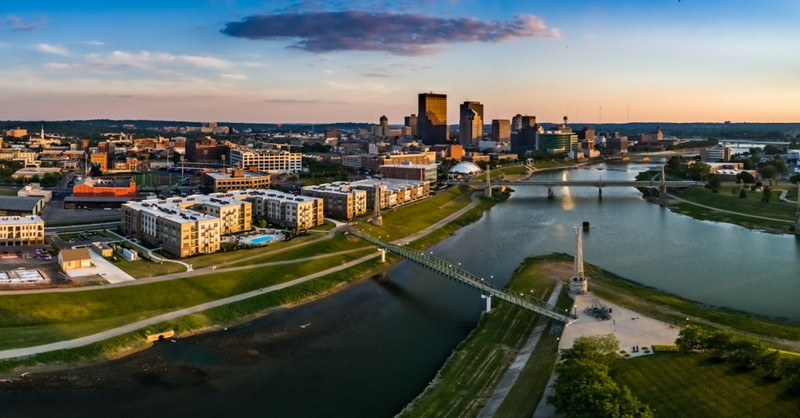 Low buy-in costs combined with steady but sure population growth and diverse employment opportunities are transforming Dayton into an investor’s dream. Dayton is quickly becoming one of Ohio’s most talked about towns, thanks to its growing population and expanding job scene. For real estate investors, these are magic words. Population growth, even if it’s slow, and diverse employment options mean prime investment opportunity, and the statistics coming out now on Dayton show that investors are starting to take notice. Enjoy sizable cash flow returns from day one with highly sought after single family homes or multi family units. Property management in place and solid tenants in place makes these fully renovated homes the perfect systematic investment. Explore these unlisted true turnkey properties which are not available to the general public. call to reserve one today!